Is your property on the verge of being foreclosure? Are you terrified that it may happen at any moment, and leave you and your family stranded? Knowing what your rights are as a homeowner and researching foreclosure information can be your saving grace. 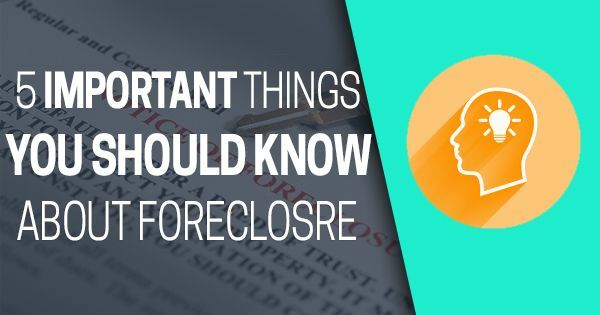 Here are 5 important things that you need to know about dealing with a house in foreclosure. If you’d like to know more about the foreclosure procedure and any options you can take as a homeowner after reading this, feel free to contact us today and speak with an SCHB professional for help. The good news is that homeowners are generally able to secure new mortgages from public government enterprises such as Freddie Mac (Federal Home Loan Mortgage Corp) and Fannie Mae (Federal National Mortgage Assoc.) a few years after they short sell instead of foreclosing. Technically, the FHA or Federal Housing Administration allows former homeowners to apply for a mortgage again after three years time. There are always exceptions to the rule, depending on the circumstances of the foreclosure. Your credit scores are definitely affected negatively when your property is foreclosed. That doesn’t mean you can’t rebuild & recover. If you’re careful and patient, you can become a homeowner again. You may also save up money to go towards a larger down payment as soon as you can. Your next lender will want a big down payment to minimize their risk. Lenders and homeowners agree on one thing – a foreclosure is difficult, time-consuming and expensive. Keep in mind that foreclosure has many steps. It’s best to start combating it while it’s just starting. Once you notice that you are lagging behind on mortgage payments, pause. Will you really be able to catch up? If you can, contact your lender and come up with an agreement right away. They may be able to put you on a special payment plan. What happens when an Intent to Foreclose Notice is already served? Is it too late to discuss and talk with my lender? It’s never too late. Contact your lender as soon as you can. You may have fewer options, but those options will still be there. It is true that a foreclosure will remain on your credit report for a maximum of 7 years. Your low credit score doesn’t need to last that long. If you can keep the rest of your finances in order, you can outrun some of the bad effects. You might need to get new credit cards with lower limits, or secured credit cards. In time, you will find it easier to apply successfully for major credit cards, secure a good loan, and finally, another mortgage. Foreclosure laws are different in every state. All the details are different- even the length of process. In Texas, the foreclosure process is only 27 days. New York sees a process period of 445 days. Though the federal government has a nationwide foreclosure assistance program for all U.S. homeowners, there are some states that offer better programs. Try to see if you can sign up for Cash for Keys. This is a program where the lender actually pays you to leave your house (in a condition both parties agree upon). The cash sum is somewhere around $2,000 to $30,000. You have money for a new place to live, and the lender doesn’t have to pay twice as much to evict you. Your lender is neither your worst enemy, nor our best friend. Actually, they are a little bit of both. Lenders and banks are in the money-making business, and it’s in their best interests to improve their businesses’ bottom line. Some lenders, in order to protect everyone involved, will offer a Lieu of Foreclosure Deed to homeowners. This agreement is about the homeowner voluntarily giving up their property, rather than going through foreclosure. This deed will allow the homeowner to avoid the negative effects of foreclosure, such as having a mark on their credit report that will stay on their report for a good number of years. It will also leave the homeowner empty-handed. Another alternative is opting for a short sale, which has far fewer consequences than foreclosure.